Deer flies are bloodsucking insects considered pests to humans and cattle. They are large flies with large brightly-coloured compound eyes, and large clear wings with dark bands. They are larger than the common housefly and smaller than the horse-fly. There are 250 species of deer fly in the genus Chrysops. Their distribution is worldwide, though they have not been reported in Iceland, Greenland, and Hawaii. An insect repellent is a substance applied to skin, clothing, or other surfaces which discourages insects from landing or climbing on that surface. Insect repellents help prevent and control the outbreak of insect-borne diseases such as malaria, Lyme disease, dengue fever, bubonic plague, river blindness and West Nile fever. 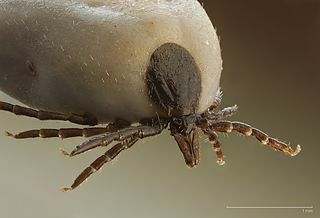 Pest animals commonly serving as vectors for disease include insects such as flea, fly, and mosquito; and the arachnid tick. 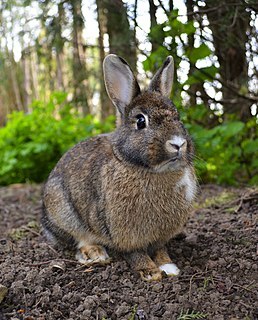 The incubation period for tularemia is one to 14 days; most human infections become apparent after three to five days. In most susceptible mammals, the clinical signs include fever, lethargy, loss of appetite, signs of sepsis, and possibly death. 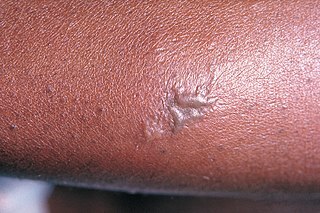 Nonhuman mammals rarely develop the skin lesions seen in people. Subclinical infections are common, and animals often develop specific antibodies to the organism. Fever is moderate or very high, and tularemia bacilli can be isolated from blood cultures at this stage. The face and eyes redden and become inflamed. Inflammation spreads to the lymph nodes, which enlarge and may suppurate (mimicking bubonic plague). Lymph node involvement is accompanied by a high fever. Anorexia is the decreased sensation of appetite. While the term in non-scientific publications is often used interchangeably with anorexia nervosa, many possible causes exist for a decreased appetite, some of which may be harmless, while others indicate a serious clinical condition or pose a significant risk. A subclinical infection is an infection that, being subclinical, is nearly or completely asymptomatic. A subclinically infected person is thus an asymptomatic carrier of a microbe, intestinal parasite, or virus that usually is a pathogen causing illness, at least in some individuals. Many pathogens spread by being silently carried in this way by some of their host population. Such infections occur both in humans and nonhuman animals. An example of an asymptomatic infection is a mild common cold that is not noticed by the infected individual. 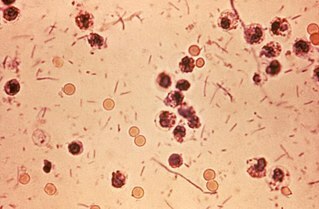 Since subclinical infections often occur without eventual overt sign, their existence is only identified by microbiological culture or DNA techniques such as polymerase chain reaction. The laboratorial isolation of F. tularensis requires special media such as buffered charcoal yeast extract agar. It cannot be isolated in the routine culture media because of the need for sulfhydryl group donors (such as cysteine). The microbiologist must be informed when tularemia is suspected not only to include the special media for appropriate isolation, but also to ensure that safety precautions are taken to avoid contamination of laboratory personnel. Serological tests (detection of antibodies in the serum of the patients) are available and widely used. Cross reactivity with Brucella can confuse interpretation of the results, so diagnosis should not rely only on serology. Molecular methods such as PCR are available in reference laboratories. From May to October 2000, an outbreak of tularemia in Martha's Vineyard, Massachusetts, resulted in one fatality, and brought the interest of the United States Centers for Disease Control and Prevention (CDC) as a potential investigative ground for aerosolised Francisella tularensis. For a time, Martha's Vineyard was identified as the only place in the world where documented cases of tularemia resulted from lawn mowing. However, in May 2015  a resident of Lafayette, Colorado, died from aerosolised F. tularensis, which was also connected to lawn mowing, highlighting this new vector of risk. It has been suggested that F. tularensis was the cause of human outbreaks in ancient Canaan in about 1715 BC and in 1075 BC. The same author has proposed the following scenario: a long-lasting epidemic that plagued the eastern Mediterranean in the 14th century BC can also traced back to a focus in Canaan along the Arwad-Euphrates trading route. This epidemic contaminated an area stretching from Cyprus to Iraq, and from Palestine to Syria, sparing Egypt (due to a quarantine) and Anatolia (owing to effective political boundaries). Subsequently, wars spread the same disease into central Anatolia, from whence it was deliberately introduced into western Anatolia. If this scenario is true, it would constitute the first known record of biological warfare. Finally, Aegean soldiers fighting in western Anatolia returned home to their Greek islands, further spreading the same epidemic. 1 2 Rapini, Ronald P.; Bolognia, Jean L.; Jorizzo, Joseph L. (2007). Dermatology: 2-Volume Set. St. Louis: Mosby. ISBN 978-1-4160-2999-1. ↑ James, William D.; Berger, Timothy G. (2006). Andrews' Diseases of the Skin: clinical Dermatology. Saunders Elsevier. p. 286. ISBN 978-0-7216-2921-6. 1 2 3 "Signs and Symptoms Tularemia". CDC. October 2015. Retrieved 8 November 2017. 1 2 3 4 5 6 7 "Tularemia". CDC. October 2015. 1 2 3 4 "Diagnosis and Treatment Tularemia". CDC. October 2015. Retrieved 8 November 2017. 1 2 "Prevention Tularemia". www.cdc.gov. October 2015. Retrieved 8 November 2017. 1 2 3 4 5 "Statistics Tularemia". CDC. November 2016. Retrieved 8 November 2017. ↑ "Transmission Tularemia". CDC. October 2015. Retrieved 8 November 2017. 1 2 "Clinicians Tularemia". www.cdc.gov. September 2016. Retrieved 8 November 2017. ↑ Hagan, William Arthur; Bruner, Dorsey William; Timoney, John Francis (1988). Hagan and Bruner's Microbiology and Infectious Diseases of Domestic Animals: With Reference to Etiology, Epizootiology, Pathogenesis, Immunity, Diagnosis, and Antimicrobial Susceptibility. Cornell University Press. p. 132. ISBN 978-0801418969. ↑ Office international des épizooties. (2000). Manual of standards for diagnostic tests and vaccines: lists A and B diseases of mammals, birds and bees. Paris, France: Office international des épizooties. pp. 494–6, 1394. ISBN 978-92-9044-510-4. ↑ "Tularemia | CDC". www.cdc.gov. Retrieved 2017-03-12. ↑ Kinkead, LC; Allen, LA (September 2016). "Multifaceted effects of Francisella tularensis on human neutrophil function and lifespan". Immunological Reviews. 273 (1): 266–81. doi:10.1111/imr.12445. PMC 5000853 . PMID 27558340. ↑ "Tularemia: Current, comprehensive information on pathogenesis, microbiology, epidemiology, diagnosis, treatment, and prophylaxis". CIDRAP. Retrieved 2008-09-29. ↑ George W. Beran; James H. Steele (22 October 1994). Handbook of Zoonoses: Bacterial, rickettsial, chlamydial, and mycotic. CRC Press. pp. 117–. ISBN 978-0-8493-3205-0 . Retrieved 28 October 2010. ↑ Mörner T (December 1992). "The ecology of tularaemia". Rev. Sci. Tech. 11 (4): 1123–30. doi:10.20506/rst.11.4.657. PMID 1305858. ↑ Jellison WL, Owen C, Bell JF, Kohls GM (1961). "Tularemia and animal populations". Wildl Dis. 17: 1–22. ↑ "Tularemia Transmission". Centers for Disease Control and Prevention. October 26, 2015. Retrieved 2017-10-06. 1 2 Putzova, D; Senitkova, I; Stulik, J (19 May 2016). "Tularemia vaccines". Folia Microbiologica. 61 (6): 495–504. doi:10.1007/s12223-016-0461-z. ISSN 1874-9356. PMID 27194547. 1 2 3 4 5 Penn, R.L. (2014). Francisella tularensis (Tularemia) In J. E. Bennett, R. Dolin, & M. J. Blaser (Eds. ), Mandell, Douglas, and Bennett's Principles and Practice of Infectious Diseases (8th ed.). Philadelphia, PA: Churchill Livingstone. pp. 2590–2602. ISBN 978-1-4557-4801-3. 1 2 3 Hepburn, MJ; Simpson, AJ (April 2008). "Tularemia: current diagnosis and treatment options" (PDF). Expert Review of Anti-infective Therapy. 6 (2): 231–40. doi:10.1586/14787210.6.2.231. PMID 18380605. ↑ Hayes E, Marshall S, Dennis D, et al. (March 2002). "Tularemia--United States, 1990-2000". MMWR. 51 (JULIOes=181–4): 181–4. PMID 11900351. ↑ Rossow, Heidi (2015-10-09). Epidemiology of tularemia in Finland. University of Helsinki. hdl:10138/156555. ↑ Desvars A, Furberg M, Hjertqvist M, et al. (January 2015). "Epidemiology and ecology of tularemia in Sweden, 1984–2012". Emerg Infect Dis [Internet]. 21 (1): 32–39. doi:10.3201/eid2101.140916. PMC 4285262 . PMID 25529978. ↑ Feldman KA, Enscore RE, Lathrop SL, et al. (November 2001). "An outbreak of primary pneumonic tularemia on Martha's Vineyard". New England Journal of Medicine . 345 (22): 1601–6. doi:10.1056/NEJMoa011374. PMID 11757506. 1 2 Byars, Mitchell (May 28, 2015). "Lafayette resident contracts tularemia after mowing lawn, dies of other medical complications". Daily Cameraaccessdate=2018-06-19. ↑ Smith S (2005-03-29). "City tells BU to bolster safety of its medical labs". Boston Globe . Retrieved 2007-05-09. ↑ Dvorak P (2005-10-02). "Health Officials Vigilant for Illness After Sensors Detect Bacteria on Mall: Agent Found as Protests Drew Thousands of Visitors". Washington Post. p. C13. Retrieved 2007-05-08. A week after six bioterrorism sensors detected the presence of a dangerous bacterium on the Mall, health officials said there are no reports that any of the thousands of people in the nation's capital Sept. 24 have tularemia, the illness that results from exposure to the bacteria. ↑ According to staff at Georgia's National Center for Disease Control, an outbreak of tularemia occurred in the village of Zemo Rene east of Gori in December 2005 and January 2006. Twenty-six persons tested positive for the bacteria, and 45 tested positive for antibodies. No cases were fatal. The source was deemed to be a water spring. Previous outbreaks were in Tamarasheni (2005) and Ruisi (1997 and 1998). ↑ Human Impact on Groundwater Management in Northern Estonia. ↑ Davis, John (January 25, 2011). "Researchers Warn of Tularemia In Area Feral Hogs". Texas Tech Today. Texas Tech University . Retrieved 2018-06-19. ↑ Biological war disease found in Tasmania Australian Broadcasting Corporation - Retrieved 4 Nov 2011. ↑ Whipp MJ; Davis JM; Lum G; et al. (2003). "Characterization of a novicida-like subspecies of Francisella tularensis isolated in Australia". Journal of Medical Microbiology . 52 (Pt 9): 839–42. doi:10.1099/jmm.0.05245-0. PMID 12909664. ↑ Trevisanato Siro I (2007). "The 'Hittite Plague', an Epidemic of Tularemia and the First Record of Biological Warfare". Medical Hypotheses . 69 (6): 1371–1374. doi:10.1016/j.mehy.2007.03.012. ↑ Trevisanato (2007), Op. cit. ↑ Dennis DT, Inglesby TV, Henderson DA, et al. (June 2001). "Tularemia as a biological weapon: medical and public health management". JAMA. 285 (21): 2763–73. doi:10.1001/jama.285.21.2763. PMID 11386933. ↑ Croddy E, Krcalova S (October 2001). "Tularemia, Biological Warfare, and the Battle for Stalingrad (1942-1943)". Military Medicine . 166 (10). Archived from the original on 2012-04-02. ↑ Sjöstedt A (June 2007). "Tularemia: history, epidemiology, pathogen physiology, and clinical manifestations". Annals of the New York Academy of Sciences . 1105 (1): 1–29. Bibcode:2007NYASA1105....1S. doi:10.1196/annals.1409.009. PMID 17395726. ↑ "Fact Sheet - Red Cloud Archived 2009-03-09 at the Wayback Machine ", Office of the Assistant Secretary of Defense (Health Affairs), Deployment Health Support Directorate. ↑ Eldredge, Debra M.; Carlson, Delbert G.; Carlson, Liisa D.; Giffin, James M. (2008). Cat Owner's Home Veterinary Handbook. Howell Book House.